Age: 35 Height: 6'3" Weight: 195LBS. Talents: Martial Arts A,B,C,D,E(chinese shadow boxing, Crane, Snake, Tiger, Iron Fist), Acrobatics, Tumbling, Criminal, Espionage, Oriental Weapons, Trance. Contacts: Capsule Corp(Engineering, Aerospace, Physics, Engineering, Electronics, Am(50) Resources), Z-Team(Hero Group, Rm(30) Resources). True Sight: In(40). Tien's 3rd eye gives him this power. He normally uses this to see through the illusion effect of after-images of objects or beings moving at hyperspeed. Stealth: In(40). Tien attained this ability through his training as an assassin. Hyper-Leaping: By making a Red Strength FEAT, Tien can use this power at In(40) rank. Recovery: By making a Red Psyche and Endurance FEAT, Tien can simulate this power at Rm(30) rank. Teleport-Self: By making a Yellow Intuition FEAT, Tien can teleport with Rm(30) ability but with a range of 1 area. This "blinking" effect looks as if he is moving at hyperspeed. He has been known to make multiple "blinks". He can do that by making both the required Intuition FEAT and a Green Endurance FEAT. Power Flare: By making a Red Psyche FEAT, Tien can simulate this power at Rm(30) ability for 1-5 turns without suffering its downside effects. Illusory Duplication: By making a Red Intuition FEAT, Tien can project up to 3 images of himself. This power takes 1 round to enact as Tien needs to concentrate in order to use it. Each projection has the same physical stats as Tien, but at -2CS. The duplicates have 30 Health points. When their Health reaches 0, they disappear. 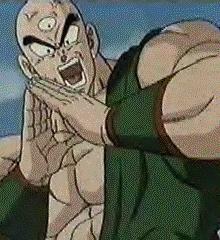 This is Tien's "12 Eyes" technique. By making a Yellow Intuition FEAT, Tien can make an Am(50) blinding attack to everyone in the area his facing. This is Tien's "Solar Flare" technique. By making a Yellow Psyche FEAT, Tien can also fire a laser blast that does Rm(30) damage. This is Tien's "Dodon Ray" attack. Extra-Body Parts: By making a Red Endurance and Psyche FEAT, Tien can grow an extra pair of arms out of his shoulders and/or upper back. It takes him 1 full turn to use this power. Once used, Tien can maintain it for as long as he is conscious or is not staggered. 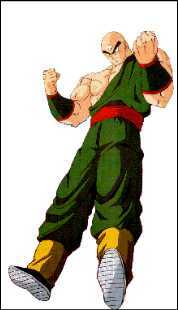 While this power is in effect, Tien gets a +1CS to his Fighting rank. Health does not change. By making a Red Endurance and Green Power FEAT, Tien can halt or slow the motion of a target as if he had Rm(30) Kinetic Control. Rm(30) force beam shaped as a triangle. The point of impact effects a 1 area range radius. Anyone or anything caught in the affected radius is subject to being under 30Xs Earth's gravity. This is Tien's "Tribeam" attack. Green Endurance FEAT: Costs 10 Endurance points that increase the force damage and gravity effect by 5 points each. Yellow Endurance FEAT: Costs 20 Endurance points that increase the force damage and gravity effect by 10 points. Red Endurance FEAT: Costs 30 Endurance points that increase the force damage and gravity effect by 15 points. Tien can only use this power up to 3 consecutive times. After the 3rd time he must make an Endurance FEAT or fall unconscious for 10-30 turns. Reflection: By making a Red Psyche and Yellow Agility FEAT, Tien can use this power at Am(50) rank. By making a Yellow Power FEAT, Tien can combine his "Tribeam" attack with this power to boost it up to Mn(80) to reflect energy attacks. Retributive Blast: This is Tien's ultimate attack. By making a Red Psyche and Endurance FEAT, Tien can focus all of his life-force into 1 blast of energy and force. It takes up to 3 turns to focus his life-energies into one of his hands. Tien can then fire the blast at a target. The blast does up to 40 force damage points and 10 points of energy damage. After using this technique, Tien must make a Red Endurance and Psyche FEAT. Failure results in death within 1-10 turns. Success, stuns him for 10-100 turns. The blast is invisible until it impacts its target. Regeneration: By making a Red Psyche and Endurance FEAT, Tien can use this power at Gd(10) rank, but suffers a -4CS on all Physical stats and powers until the regeneration is complete. Kinetic Bolt: (from hands) He can activate this power by making a Green Psyche FEAT. This power is at Ex(20) rank. Power Detection: He can use this power by making a Yellow Intuition FEAT. Rm(30). This power cannot sense robots or androids. Weakness: Every time Tien uses his magic-related powers he loses 1 point of Health per round of use. For each magic-related power used above Gd(10) rank, Tien loses an additional 1 point of Health per round of use per each rank above Gd(10). 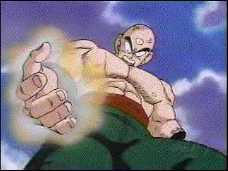 Example: Tien uses his "Tri-Beam" attack. The attack is Rm(30) rank. He loses 3 points of Health (1+2=3). The exception to this rule is the Regeneration power. Lost Health points can be regained through rest. Note: As penance for his crimes as a former assassin, Tien has made a vow of poverty and chosen to live a life of a nomadic hermit. He is a reserve member of the Z-Team.